Order Up. Shorten Decorative Laminate Production and Time to Market. In 2016, the InPrint Industrial Print Show ran a survey with I.T. Strategies in regards to décor and its place in inkjet. The InPrint Décor Survey & Report asked participants which segments within décor have the strongest potential for digital/inkjet technology. 53.92 percent of respondents chose flooring and laminates. Flooring, according to Mark Hanley, president, I.T. Strategies, is defined as anything covering a subfloor. The estimated value of the 2014 global flooring market was $240 billion wholesale dollars. Thanks to advancements in inkjet technologies, short-run, custom work is becoming more common. Digital printers are integral in the creation of decorative laminates primarily used in flooring, but sometimes even countertop, doors, cabinets, siding, or wall applications. Features like expanded color gamut and durable UV ink sets are attractive to surface manufacturers. Single-pass devices are frequently used in high-production facilities, but multi-pass printers are ideal for specialized, one-off requirements. Some presses print directly to the laminate substrate, but technology needs to fully mature to make that a cost-effective reality. Currently, most processes involve directly printing to a décor paper, which is then applied to the substrate. To increase the adoption rate of digital printers in the flooring space, manufacturer needs must be met. Above: The Roland VersaUV LEJ-640FT UV flatbed printer utilizes CMYK, white, and clear coat inks to offer the ability to include textures and simulate embossing on output. Digital influences decorative laminates used in flooring, countertop, and wall applications. Prior to digital this work was accomplished in other ways, which are not as cost effective when it comes to smaller, more customized runs and quick time to market. Printing decorative laminates traditionally involves the use of engraved cylinders or rotational gravure printing. “Gravure printing is a specialty process requiring an engraved cylinder that costs up to $10,000 for each color. With a four- or six-color process, it could cost up to $50,000 or more. And, there are fewer plate suppliers available to do this work, which reduces the number of designs available on the market,” explains Gerard Winn, senior product manager, Xaar. “This method presents problems as printers try to scale the projects they’re printing, especially when it comes to minimum run rate. 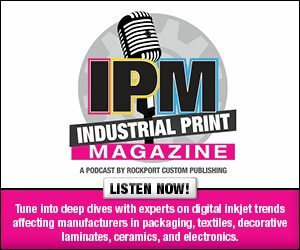 This ends up putting the liability for extra inventory on the laminators, a burden that, in the end, ends up costing them an extra $1 million dollars every year on average,” continues Patti Smith, VP, worldwide marketing and sales operations, commercial inkjet printing, Eastman Kodak Company. The final part of the process is also time consuming, although it delivers in the durability department. “Traditionally, decorative laminate is manufactured either by a high-pressure laminate system or thermally fusing the laminate by layering and fusing a resin-impregnated sheet of décor paper directly to a special composite or substrate,” says Jay Roberts, product manager, UV printers, Roland DGA Corporation. As small quantities and increased variety continue to be the norm, decorative laminate manufacturers look for ways to speed up time to market and shorten the production process. Digital printing technologies is one option. “Digital makes the industrial production of small batch sizes possible. This goes along with the individualization of mass production. The producing companies can embed the digital printing in existing process chains. They can react quickly on market trends and customer demands and profit from the shorter time to market. The shorter set up times are another aspect of the flexibility that industrial inkjet ensures,” shares Dr. Rene Pankoke, owner/CEO, Hymmen GmbH. Sumio Arima, senior manager, PD 2 sales department, corporate printing device group, Kyocera Corporation, agrees, explaining that the implementation of inkjet printheads has contributed to the shortened process by eliminating the need for printing plates and allowing for the immediate printing of only the required amount of design data. Print on demand is just as useful to decorative laminate manufacturers as any other segment—think book publishing or textiles. “Organizations don’t have to keep a large inventory of material on hand just in case and are able to better allocate resources as they’re actually needed and save significantly on inventory and warehousing,” admits Smith. Specific features on digital printers—for example wider color gamut to achieve better tones and realistic shades—make the technology ideal for decorative laminates. At Kodak, the inks used in the company’s digital processes are micro-milled down to nanoparticles, which reduces scattering in order to get a wider color array, maximizing print quality on a variety of substrates. It also prevents metamerism, which is the perceived matching of colors in some lights that don’t actually match in other lights. “In the décor market, metamerism can be a major detriment because people’s homes are lighted in different ways. The last thing a laminator wants is to have customers think they’re getting one color, only to find that, in a different light, they have a different one,” explains Smith. Digital UV inks are another popular feature. “The advantages of UV inks in particular are of interest to us. They work on paper processed from roll to roll, and also directly on boards. This is a feature that did not exist before digital. The direct printing on boards is only possible since the flexibility of digital printing can be used,” says Pankoke. Digital printers used for decorative laminates are predominately single pass. However, that doesn’t mean multi-pass printers aren’t an option. Winn explains that in single pass, the printheads move directly onto a moving substrate. “Simply put, printing directly onto a moving web minimizes any time delay between sheets, so that you can print as fast as the inkjet technology allows,” he continues. “Most of these printers use single pass, primarily because of the speed and efficiency that method enables. Since digital printing is used for high-volume productions, it needs to be able to produce at scale. Multi pass is primarily used for small digital presses that create samples and design proofs. They still produce great results, but just can’t match the output needed for the kinds of orders today’s decorative laminate printing projects entail,” shares Smith. Most of the mass production printers are single pass, agrees Roberts. Multi-pass devices, like those from Roland, are tailored to more customized, boutique parts of the industry, according to Roberts. Roland is also involved in prototyping with its multi-pass printers. Most decorative laminate manufacturers using digital print on décor paper and then fuse it to the substrate. It is possible to print directly to the substrate, but this process requires further technological advancements for single-pass printers in particular. “The technology for printing direct just isn’t there yet. Technology is, however, moving quickly in that direction because of the clear benefits that printing direct offers. By printing direct, more pressure is applied to ink drops, allowing for continuous printing and a greater throw distance. All of this results in a higher quality print,” says Smith. Pankoke argues that both—paper print and direct print—is possible. “With direct printing on the board there are different technologies used, lacquering with UV lacquer after printing or applying melamine resin and drying in a hot press. The process depends on the individual needs of the customer,” he explains. Multi-pass UV flatbed digital printers like Roland’s and other traditional flatbed machines are also able to directly output onto a laminate-type material. “This makes customizing flooring or cabinets much easier and speeds up the production process. Architects and interior designers can create truly one-of-a-kind products for their customers. Although these innovative UV flatbeds don’t have the ability to produce massive amounts of generic products, they are unbeatable for cost-effectively creating artistic one offs,” argues Roberts. There are factors delaying increased adoption of digital print into decorative laminates, however, vendors foresee these being overcome in due time. A constant dialog between the wants and needs of the decorative laminate manufacturers and printer designers is key to increased adoption. “In many of the industrial laminates markets, digital print is replacing or complementing an already existing analog printing technology. Companies already in the laminates business and digital print solution providers need to continue a dialog and agree on the benefits and establish and communicate the value and positioning of industrial scale digital printing of decorative laminate to the market,” explains John Harman, business development manager, Ricoh Company Ltd.
For some, the fear of a digital printer going down or not performing consistently is enough to deter an investment. “Organizations turn to digital printing to process large orders in an efficient manner, but when they can’t rely on the press to perform consistently, this effort ends up being undertaken in vain. Since these issues drive up cost while decreasing speed of production, they’re some of the primary reasons that the industry is being slow to adopt digital,” admits Smith. Printer manufacturers bring to market single- and multi-pass product lines specially tailored to decorative laminate suppliers. Other products, not necessarily just for decorative laminates, are also available. Hymmen Jupiter single-pass digital printing lines can print substrates in required lengths with any design. Each design can be placed in a row one after the other. The line allows for the reproduction of any design at any time in case of a special order. Six models make up the portfolio—JPT-W 840, JPT-W 280, JPT-W 560, JPT-C, JPT-W 1400, and JPT-L. All vary in maximum print width and some print board substrates versus roll materials. Kodak’s laminate décor solutions are driven by Kodak Stream Inkjet Technology. It offers color consistency, robustness, and durability comparable to gravure printing. With water-based nano-particulate pigment, a wider color gamut, low cost, and image permanence are all offered. Roland offers the VersaUV LEJ-640FT UV flatbed printer. It prints onto materials up to six inches thick and weighing 220 pounds. The multi-pass printer utilizes CMYK, white, and clear coat inks to offer the ability to include textures and simulate embossing on output. SPGPrints announced in November 2017 the PIKE 700 UV inkjet hybrid printer. It combines digital capabilities with pre-treatment and added-value finishing processes, in a single pass. At 700 millimeters wide, the roll-to-roll press features up to ten inkjet positions in a central cylinder configuration with CMYK plus white standard. It reaches a maximum resolution of 1,200 dpi. The PIKE 700 is designed to enable consistent color uniformity within 1.5 DeltaE on both supported and unsupported paper and film materials up to 450 micrometers thickness. Decorative laminates are increasingly used in flooring, as well as countertops, doors, cabinets, siding, and even wall applications. In using digital printing technologies, the capability to offer personalization in a quick manner becomes a reality. “As the world demands more customized products along with a faster time to market from designer to print, and a wider range of laminate designs, digital enjoys a strong value proposition,” concludes Winn.